certificate of origin, insurance certificate, packing list, as well as any other documents required for customs clearance, to the importer’s bank (also known as collecting bank), together with the payment instructions. 1. A sales contract is entered into by the exporter and the importer and a purchase order is accepted. 2. The exporter delivers the goods to the importer and the shipping documents are received by the exporter. 3. The exporter instructs their bank to deliver the documents to the importer against the bill of exchange. 4. The exporter’s bank forwards the shipping documents to the presenting bank. 5. 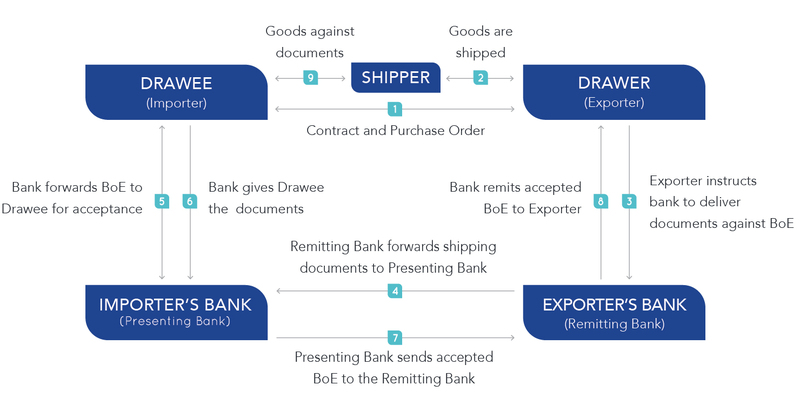 The importer’s bank presents the shipping documents to the drawee (importer), who checks and accepts the Bill of Exchange. 6. The presenting bank then gives the drawee the documents and. 7. Returns the accepted Bill of Exchange to the remitting bank. 8. The remitting bank returns the accepted Bill of Exchange to the drawer (exporter). 9. The drawee (importer) presents the full set of original documents to the shipper and receives the goods.